Here is an opportunity to introduce your child to sailing or build upon current skills with more advanced training. 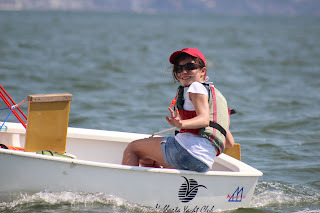 Summer Sailing Camp at the Vallarta Yacht Club while taking vacations in Riviera Nayarit. One week classes are for ages 8 to young adult, with 3 different levels offered at the VYC each week during July and will be offered from 11:00 am to 5:00 pm, with lunch provided. All your child needs is a life vest, sun screen, and the excitement of a new adventure! "Optimist" boats, for Beginner and Advanced students, are small safe boats used to teach and perfect sailing skills. Laser boats are faster, longer boats for older youths with basic sailing skills. Riviera Nayarit is one of the top sailing venues in the world. Summertime is the perfect opportunity to give your child the chance to learn skills that can last a lifetime: sportsmanship, teamwork and self-reliance, as well as a love and respect for the sea. Our program teaches youths how to sail to the best of their ability and interest, and to encourage growth in skill and competence through both individual and team participation. VYC Jr Sailing students have competed in Mexico's Jr Olimpiadas each year, earning gold, silver and bronze medals. This summer, one VYC student will represent Mexico in the World Sailing Championships in the Dominican Republic! The cost for Sailing Summer Camp is $1,850 pesos per week, including meals. Special low pricing applies to current Jr Sailing Students. Summer Sailing Camp is offered by the Vallarta Yacht Club, located next to Paradise Village Mall and Marina in Nuevo Vallarta. For more information, contact the VYC at (322) 297-2222, visit VallartaYachtClub.org find us on Facebook, or see the program come alive in our YouTube video.